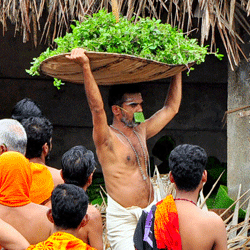 All the “kalasham” so far offered as pooja are brought to the Manithara by the Brahmins together. Usually this ritual is performed only once in every temple. But in Kottiyoor, in one year, it’s performed twice. Kalasham sent by the Samuthiri Kovilakam is first offered as abhishekam.